Artists who work from the figure talk a lot about “gesture.” When you’re “getting the gesture down,” you’re talking about putting life into your drawing of the figure. Life-vitality-movement- dynamic-drama—hey, even attitude. This is not something that comes later, with a touch here or there. This vital quality has to be in the very first strokes you put on paper. In other words, you have to grasp the gist of the pose at a glance. Psychologists have a word for it: “Gestalt.” When you see the Gestalt of something, you see the whole thing, you don’t scan bit by bit. Rather amazing, when you think about it. We do this all the time, when we recognize a face, for example, or when we recognize a person in the distance by his gait. If seeing in the Gestalt mode is such a natural part of our everyday perception, what’s the big deal? Why would we have to make a special study of it in drawing class? The short answer is, I dunno. All I can say is that when we start to draw something or somebody we are seduced by details. This seems to be a universal experience. The beginning drawing student inevitably wants to draw some detail, like the eye, the lips, the ear, or that luscious waive of hair over the forehead there. Part of my job as a teacher is to dream up exercises that get the student to see the whole ball-o-wax, to grasp the gist of the gesture. 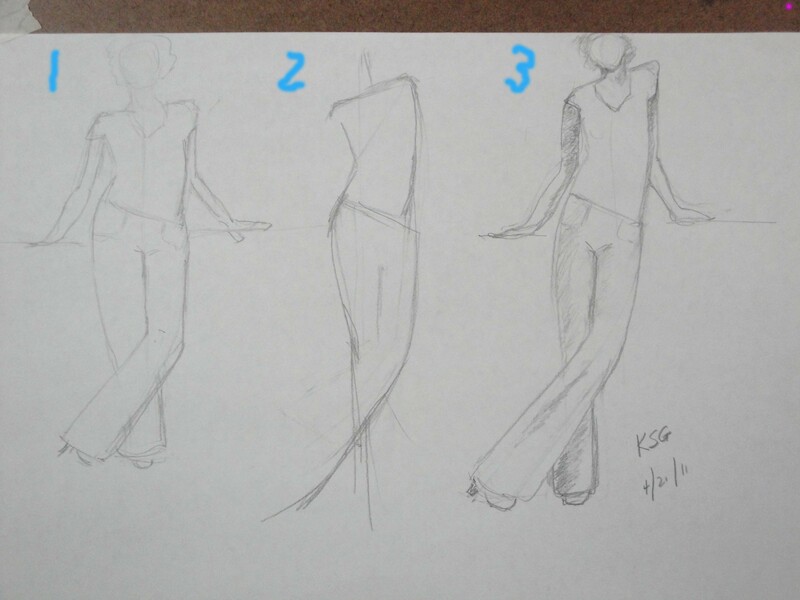 In drawing class today, we faced this gesture challenge, yet again. 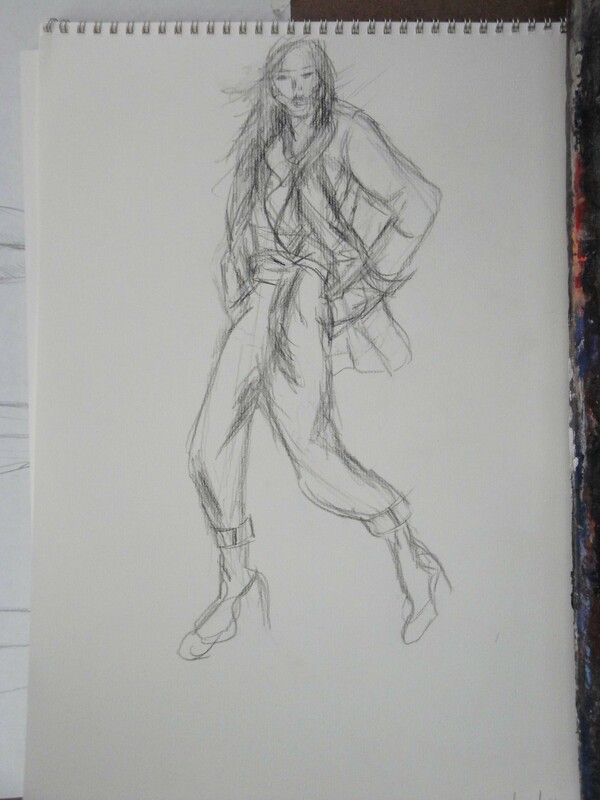 Looking at magazine photos, the student had to get the gist of the pose down in a few sweeping, rough lines. This involved proportions, of course. Seeing this way can be disconcerting at first. It takes practice. Here’s a page by Karen G. Notice the literalness in drawing #1. It’s correct, but rather stiff and lifeless. In #2 she went for the gesture in just a few lines. Wow! It’s all there! 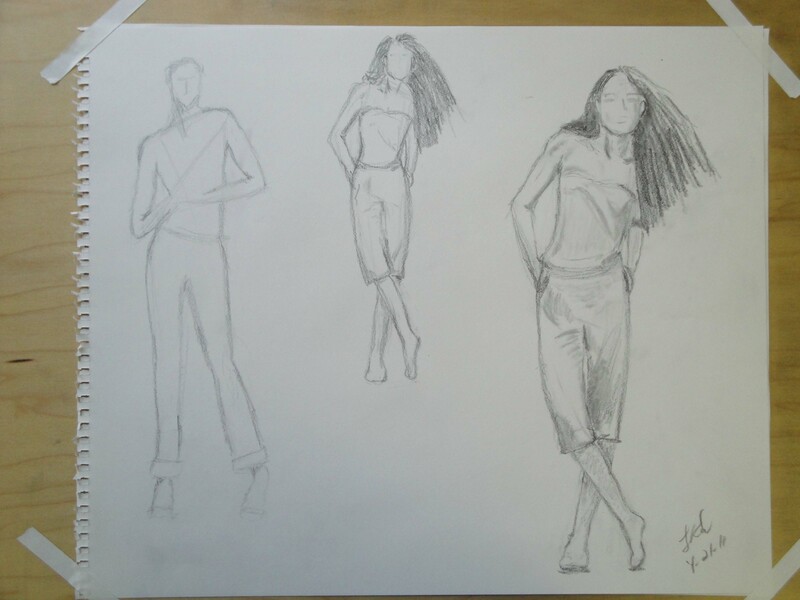 Then, repeating those gestural lines, she developed the drawing further in #3. 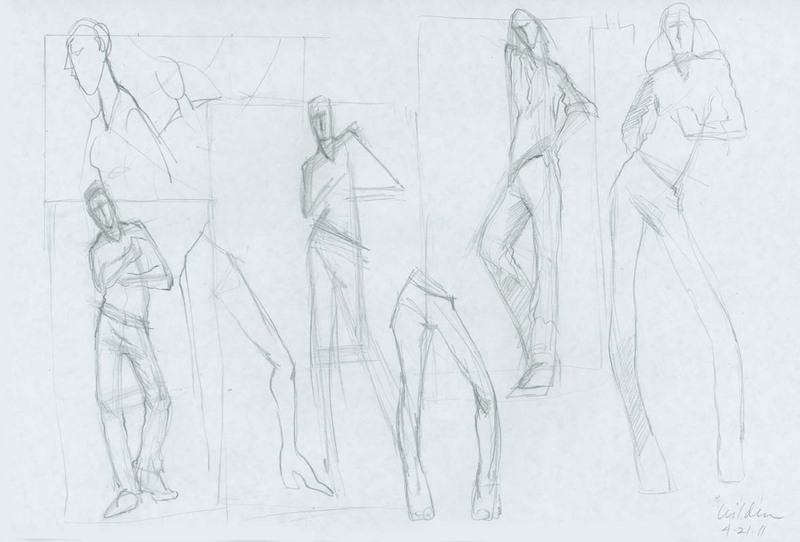 The crossed-over leg is too long, anatomically speaking, but it doesn’t matter because the vitality in the figure triumphs over anatomical correctness. This page, just three drawings, documents progress in seeing. Have I mentioned…this takes practice. But the models to work from are all around you: open a magazine. See? there’s no excuse. Below, two more drawings and “models” from today’s class: Linne D. and Vera C. Top, a page of studies I did while sitting next to students and drawing along with them.